Summary: A nice twist on a zoo book, Michael Hall pairs animals with various emotions. The artwork is designed to incorporate several heart shapes in each colorful animal. It is simple yet so captivating! The simple rhymes and bold pictures wonderfully illustrate how love can be many different things, such as eager as a beaver, steady as a yak or silly as a seal. You cannot read this book without trying to make some of the animals! 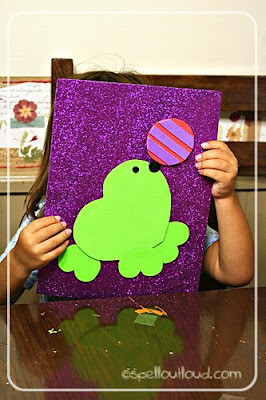 :) You can find the instructions plus printable patterns for the seal and the frog at Spell Outloud. Since I knew we would be talking about animals, I purchased a package of zoo animal foam stickers. The first activity we did was sort the stickers by animal (or plant—there were trees included). I used an old party platter for this activity. While sorting, we named the animals and went over the first sound of each animal’s name. Next we played a counting game. I took a 12x12 piece of paper and folded it into fourths. Then I wrote the name of each animal in its “cage” aka square. My daughter rolled the dice to see how many of that animal needed to go in the cage. For some reason she rolled a 5 most of the time :) There were additional stickers on the back of the page too. She asked to do her own zoo picture with the stickers. This was her final result. She concentrated so hard peeling off the sticker backing on the animals. That was a great way to practice fine motor skills. We went over our poem/handwriting and coloring page. You can find the download under the Letter Z. We pulled out our Target Dollar Spot puzzles and worked on them again. The girls gathered up their stuffed animals and played zoo. We originally did this activity while studying plants, but it would be fun to do while talking about zoo animals too! 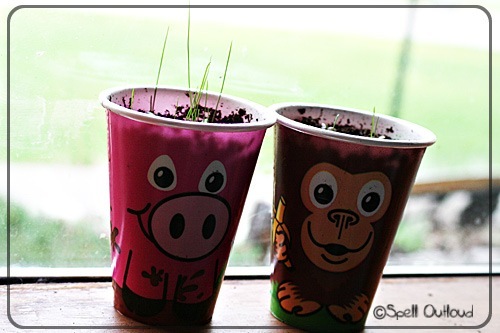 Fill Zoo Pal cups with planting soil. Sprinkle grass seed and cover with a little more dirt. Lightly spray with water and watch the animals grow hair!